Assessing the value of a rental property and how it might benefit you over time is never easy, until now! The Rental Property Template is the perfect tool for potential rental property owners to make informed decisions about their investment and learn how different factors all contribute to the value of a home. 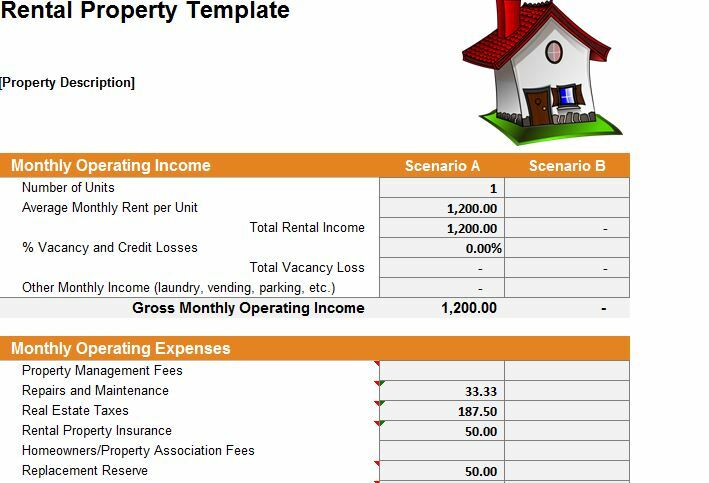 You can use this free template to make fast and accurate calculations for you and then choose which potential rental property would be the right fit. You can learn more about this free template by reading the instruction guide below. Downloading this free template file is as simple as clicking the link at the bottom of this page. Once you have the document up and ready to go, start at the top of the page and describe the desirable aspects of the property and the relative dimensions. You will notice that there is a “Scenario A” and “Scenario B” in the tables of this document. This is just so you can compare two potential rental properties at the same time. From there, you can start to fill out the individual category sections. This is pretty simple, each section will tell you exactly what to enter. For example, in the “Monthly Operating Income” section, you will list the monthly rent you would expect to list. The template will then take the information you enter and give you accurate calculations for your return on investment information for both options. You can then make the best financial decision from there. The template will provide the total cash flow before and after taxes, as well as the total ROI. Finding a rental property that will make you money is much simpler with this free template calculator at your side.